'America First': From Charles Lindbergh To President Trump : Parallels Charles Lindbergh became an instant hero when he flew across the Atlantic. But that wasn't his only moment of fame. He also created a hugely popular political movement — the America First Committee. 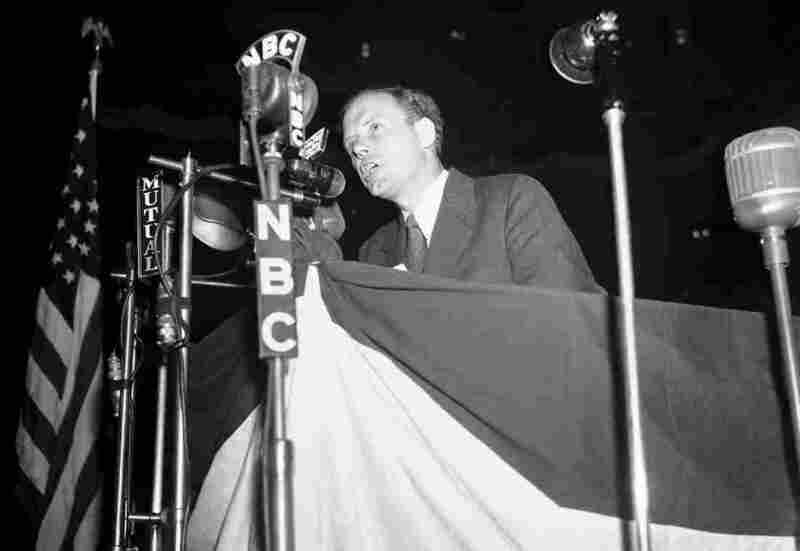 Charles Lindbergh speaks at a rally of the America First Committee at Madison Square Garden in New York, on May 23, 1941. Lindbergh was a leading voice of opposition to U.S. involvement in World War II up until the Japanese attack on Pearl Harbor. "I have been forced to the conclusion that we cannot win this war for England regardless of how much assistance we send. 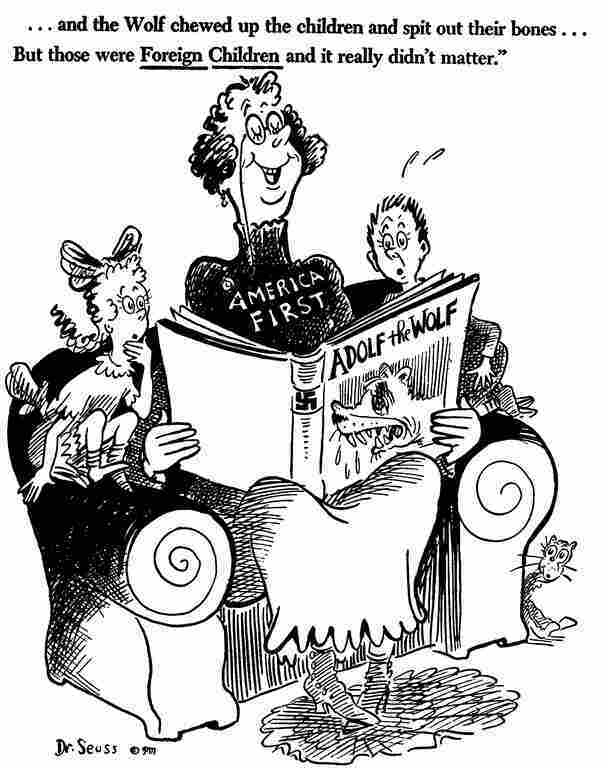 That is why the America First Committee has been formed," Lindbergh said in 1941, just months before the Japanese attack on Pearl Harbor that launched the U.S. into World War II. "From this day forward, a new vision will govern our land. From this day forward, it's going to be only America first, America first," Trump said at his inaugural on Jan. 20. Trump has never made the connection to Lindbergh and his group, and there are both similarities and differences. In foreign policy lingo, Lindbergh and his group were isolationists. They wanted to keep the U.S. out of most foreign entanglements. Trump is more commonly described as a unilateralist — someone who thinks the U.S. can be engaged around the world, but on its own terms, unconstrained by alliances or multinational groups like the United Nations. Still, Trump, like Lindbergh before him, argues the U.S. should not be the world's policeman. "The U.S. should not be promoting its values internationally. It should not be telling other counties how they run themselves. The multilateral institutions that the U.S. has had a significant role in are part of that problem." Trump has plenty of company in attacking the global status quo. Liberals and conservatives argue that institutions like the U.N. and NATO should, at minimum, be restructured to keep up with a world that has changed dramatically since they were established. Critics also point to U.S. military actions that have resulted in inconclusive wars at enormous costs. "Many Americans looked at the policies of the past decades and saw that the U.S. acting as the global sheriff did not benefit them," Bremmer said. "It was trillions of dollars wasted in Iraq and Afghanistan, with thousands of American lives lost ... and they don't want to see that anymore." Trump has talked mostly about disrupting the world order, without saying what would replace it. Yet if the U.S. simply recedes from its superpower role, Russia, China and Iran and others would gladly step in to fill that void, according to many analysts. "The international order that America created is now under unprecedented threat from multiple directions," retired Gen. David Petraeus warned recently on Capitol Hill. Petraeus said the U.S. still has the resources to be a superpower, but he worries about "something perhaps even more pernicious — a loss of self-confidence, resolve and strategic clarity on America's part about our vital interest in preserving and protecting the system we sacrificed so much to bring into being." Trump has focused on the burdens rather than intangible benefits that the U.S. received by working to shape the world in its image for decades. He argues that NATO allies aren't pulling their weight, those U.S. troops in Asia since World War II are too expensive, and trade agreements are costing American workers their jobs. "For many decades, we've enriched foreign industry at the expense of American industry, subsidized the armies of other countries, while allowing for the very sad depletion of our military," Trump declared at his inaugural. 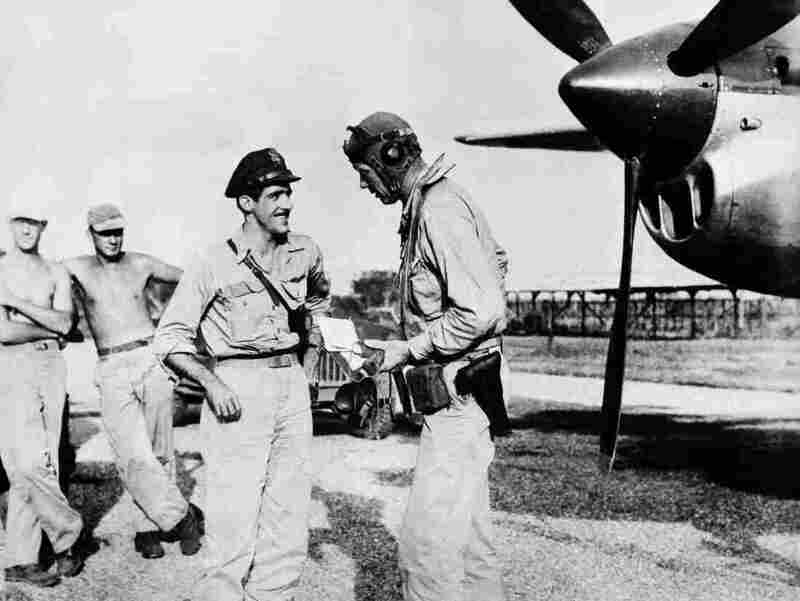 Lindbergh (right) at a U.S. military base in the Pacific in 1945. He flew more than 50 combat missions in the Pacific during World War II. Lindbergh once expressed similar sentiments. "The doctrine that we must enter the wars of Europe in order to defend America will be fatal to our nation if we follow it," he said in 1941. But then came Pearl Harbor, and that changed everything. Lindbergh's movement collapsed — and he not only backed the U.S. war effort, he joined it. Although he had civilian, not military status, he still manged to fly more than 50 combat missions in the Pacific. And after the war was over, he was often back in Europe, supporting the U.S. effort to rebuild the Continent. Every president faces unexpected crises, and as Trump sets his course in a volatile world, his own interpretation of America First may also be challenged.